Paw Print Genetics - Help! I Bred Two Cream Dogs and Got an All Black Litter! The genetics of coat color inheritance for an individual dog can be confusing, and for some breeds, determining the potential colors of your pups can be even more difficult. For those breeders that are concerned or simply curious about potential coat colors of their future litters, genetic testing of prospective parents can save a lot of time, money and heartache when it comes to predicting colors. This color chart attempts to show how the various, known genes interact to produce certain colors. Some genes are dominant over other genes, while some alleles (specific copies of a gene) are dominant over other combinations of alleles at the same gene (or locus) or dominant over other genes in this pathway. By understanding how these genes interact, you will be able to better predict the outcomes in your breeding program. So how can two light colored parents produce an all black litter? In some breeds, such as the Labrador retriever, it is not possible for two yellow parents to produce black or chocolate pups because the gene that controls whether a dog is yellow or black is the E locus. Yellow Labs are ee and black Labs are either Ee or EE, so two ee parents cannot produce a black pup. However, in other circumstances, specifically in poodles and related breeds, cream colored dogs can produce a black pup. So the breeds of the parents matter, as some breeds, such as the poodle, have genetic modifiers that can change the color of the coat over time (most commonly a progressive graying or “fading” of the coat). These modifiers can be observed in the phenotype of the dog (how the dog looks), but the genes and mutations that are causing the color fading over time are not known. Because the mutations are not known, there aren’t any currently available tests to look for these modifiers. Therefore, if you buy a dog as an adult, you may not know what color it was as a puppy and may not be aware that it has faded to another color as it aged. Thus, genetic testing can provide you some answers regarding the ‘base coat’ of the dog and knowing the dog as an adult, gives you clues as to whether a particular dog will ‘breed true’ or may have the fading gene mutation that it can pass on to the puppies. True cream or yellow dogs, such as golden retrievers and yellow Labrador retrievers, have the genotype, e/e, at the E locus and are born this light color. If the dogs are also B/B or B/b at the B locus, they will have black leather on the nose and footpads as well as around the eyes and mouth. Puppies from these dogs can only inherit the ‘e’ allele from such a parent. But what about the poodle? Like the golden retriever and Labrador retriever, poodles can also be light in color by inheriting the e/e genotype at the E locus. However, other mechanisms maybe at work for those light colored poodles with a different genotype at the E locus (EE or Ee) that are born a dark color and have instead faded over time. In addition, other genes, such as certain alleles at the A locus and K locus can produce ‘dominant black’ dogs that may also fade over time. The only way to know the true genetic color of these dogs and the potential coat color of the puppies they could produce is to do genetic testing. 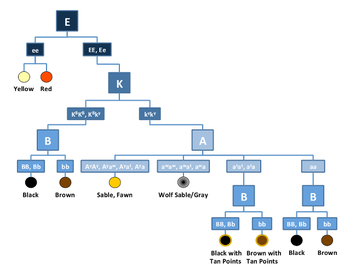 There are several resources on the Internet that can help you understand color inheritance in your dog, including poodles and other breeds. Paw Print Genetics offers a comprehensive menu for color testing and has genetic counseling available prior to ordering (pre-test counseling) or after you have received your results (post-test counseling). We are committed to helping you understand the genetics of your dogs and how genetic testing can be used to improve your breeding program. You can contact us at AskUs@pawprintgenetics.com or call us toll free (US and Canada only please) 1-855-202-4889 or direct at 509-483-5950. We look forward to helping you with your color testing. Why Do My Dog’s B Locus Results Say ‘maybe black or brown’?